Well, we had a couple days of nice weather. Friday and Saturday were really nice. I guess for Sunday, Mother Nature thought we had enough nice, so was cold and windy. I did see the robins again; hopefully they will stay. We had Mr. Bear on Tuesday night sometime. Must have been a BIG one as he had to stretch about 8 feet in the air to get the bird feeder. Got our suet feeders a couple days earlier. I’ve seen quite a few photos on Face Book, so guess he’s been around. Don’t forget, mark your calendar. The Red Cross will be at Darway Healthcare and Rehabilitation Center for a blood drive on May 2nd, from 9 a.m. to 2 p.m. Community is welcome. Please contact Jamie Killian, Activity Director to sign up. 570-924-0119 or Jamie.killian@darway.org. Happy Birthday wishes to Rosanne Lukachik and Tom Beck (our Rockhound buddy), 18th; Holly Ann Sperry, 20th; Jon-Paul Matychak, 23rd; Katherine Kapler, 25th. Have a nice day. Would be nice to get some good weather so folks can get in some outdoor activities, gardening, planting flower beds. Guess that’s the news for now. Enjoy your week; might need the umbrella, but it’s still nice to get out and about in the fresh air. 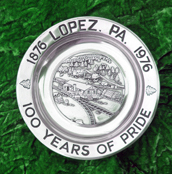 Have news call me at 570-928-9238; mail me; see me or e-mail me at news@lopezpa.com. I’ll get it in for you. Thanks for reading and I’ll be here next time.